Several pieces of rare Kobe Bryant memorabilia are headed to the auction block this June. Among the items are high school jerseys and rings as well as a team-issued 2000 NBA Championship ring that was given to Bryant's father, Joe Bryant and a special version made for is mother, Pamela Bryant. The Kobe Bryant Collection is being sold by Goldin Auctions, who recently sold a 1909 T206 Honus Wagner for $2.1 million. The cornerstone of the Kobe Bryant auction is a uniform from his freshman year at Lower Merion High School. Comprised of a road jersey and shorts, it is believed to be the only remaining high school jersey with the number 24 on it. He only used the number during his freshman year before switching to 33. Bryant later switched back to 24 for the 2006-07 NBA season. Two other Kobe Bryant LMHS uniforms are also being sold, one home and one away. Both have the number 33. The auction also features the earliest-known Kobe Bryant game-used jersey available at auction. Up for bid will be his Italian Rieti #44 jersey. Besides the Lakers championship rings, other rings are also part of the sale including his McDonald's All-American ring, 1996 High School State Championship ring, and Bryant's 1998 and 2000 NBA All-Star rings. 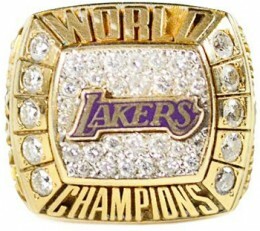 "A team-issued championship ring is among the most treasured of all sports collectibles and the opportunity to own one from an active player as historically significant as Kobe Bryant is rare," said Kenny Goldin, founder of Goldin Auctions. " All of the items in the auction are being consigned by Bryant's family. They come a letter of authenticity from Pamela Bryant, stating they've been held by the family until now. A second LOA is being included by Goldin Auctions. More Kobe Bryant items are scheduled to be added closer to the auction. 1996-97 KOBE BRYANT BOWMANS BEST # R23 BGS 9.5 VERY NICE CARD. Kobe Bryant Upper Deck UDA Auto Signed Inscribed Jersey Archive Box 12 24 RARE!